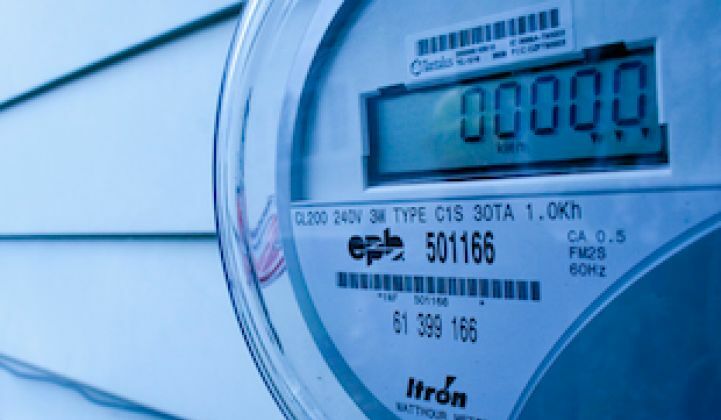 Itron’s Linux-enabled, IP-connected smart meters get their first test as host for third-party applications. Last week, smart metering giant Itron and volt/VAR optimization vendor Utilidata announced a partnership to merge their technologies — not an uncommon thing in the advanced metering infrastructure business, where smart meter data and voltage control equipment are increasingly intertwined. But this may be the first time it’s been offered as an app. The word “application” is often used in the utility and energy space to imply a similarity to the world of smartphones, where devices can upload and run software built to a common standard with a minimum of fuss, and share data with each other and the network as a whole. The vast majority of smart meters, grid sensors, voltage controllers and substation management systems simply aren’t built in a way to make this vision a reality, of course. Utilities use a legion of specialized, legacy software platforms and grid control systems that can date back decades. Even the smart meters from the turn of the decade tended to lack the memory and processing power to do much beyond their core cash register functions. But Itron’s OpenWay Riva platform, launched in 2014, was designed specifically to bring AMI up to the smartphone standard. Its new devices pack enough memory and processing power to support over-air upgrades and run multiple software packages simultaneously. They also run Cisco’s IOx networking software for distributed computing, based on the open-source Linux operating system — an environment that opens the roster of potential “app” providers from thousands to millions. Itron has since rolled out a set of homegrown software for high impedance detection, phase imbalance detection, solar energy monitoring, electric-vehicle charging management, and other uses. But “this is one of the first announcements of someone else’s applications that’s going to run out in the edge, on the Riva platform,” said Sharelynn Moore, Itron senior vice president of networks. This milestone represents several years of work with Utilidata, which has worked with Itron in the past, she noted. Itron has been sending out developer kits to select partners since 2016, and last year picked Bsquare to manage licensing and revenue-sharing for third-party apps. “We’ve moved to a 'dev ops' environment — we run it, we make changes, we test it, we iterate, and we go,” she said. “We’re on this rapid pace to seeing things come to fruition,” with several more third-party applications expected to be announced in the coming months, she said. Utilidata’s AdaptiVolt technology has been running for more than a decade at its earliest installations in the Pacific Northwest, and large-scale deployments are underway with AEP in Ohio and National Grid in the Northeast. A typical installation would involve up to a dozen different “control elements” such as line tap changers, voltage regulators and capacitor banks, along with a high-fidelity sensor to provide the accurate and fast data required for its signal processing approach to manage voltage on the grid. “We do use AMI data to drive better efficiency,” Utilidata CEO Josh Brumberger said. “But it was a ‘nice to have,’ not a ‘need to have,’ for us, because the industry hadn't evolved enough toward the grid edge.” In other words, most utilities didn’t need high-fidelity voltage control at the secondary distribution circuit level, and most couldn’t support it without a costly investment in purpose-deployed sensors. But OpenWay Riva allows Utilidata to do much of the front-line data processing and analysis at the meter, Brumberger said. The benefits are twofold: an improvement in data coming from every endpoint in the grid network, and a reduction in the amount of data that needs to be sent up the network to the back office for processing and analysis. Volt/VAR optimization (VVO) is a term for various types of technology that seek to reduce overvoltages on the power grid — a form of wasted energy — without allowing voltages to fall below certain minimums that protect equipment from stress and potential failure. The vast majority of VVO projects are aimed at achieving these broad-based efficiency gains, leading to the development of the term "conservation voltage reduction" (CVR) to describe them. Utilidata and Itron are also targeting utilities that want to use the app to “optimize grid performance and reliability” and “integrate distributed energy resources.” VVO can play a role in these areas, by managing voltage fluctuations from intermittent solar energy, or targeting voltage reduction for circuits that are being overloaded and face potential failure, for example. But these applications require a more fine-grained visibility and control over specific portions of the grid than is provided by traditional, centralized CVR schemes. Utilidata’s distributed sensors helped it achieve visibility on the primary feeder level, Brumberger said. With access to the meter, it has a view on every endpoint on the network. “Our approach was always [that] there’s an incredible amount of insight to be gleaned from the number of devices on the utility’s distribution grid. We’re just starting to scratch the surface in terms of the value we could derive,” he said. It’s all connected via OpenWay Riva’s IP-based network, which spans cellular, RF mesh and powerline carrier technologies, to cover the different kinds of networks required to reach distant rural locations and multi-story apartment building dwellers alike. It also comes with the latest in Itron and Cisco network management and cybersecurity software, Moore noted — an important point for utilities concerned about reliability and security. Itron isn’t offering the platform on the meters of Silver Spring Networks, which it acquired, or on its own prior generations of meters, which lack the Linux operating system and native memory to host the applications, she said. But it does intend to support Riva on Silver Spring’s Gen5 networking platform over time. Itron and Utilidata didn’t disclose which utilities are using the new capabilities, although Moore said one Northeast U.S. utility is taking a lead on deploying the technology. That would appear to point to National Grid, which has relationships with both companies. Neither Moore nor Brumberger would confirm or deny whether National Grid is the utility in question. But it’s likely that the combination of Itron’s meters and network and Utilidata’s analytics and control capabilities would likely be most useful to a utility that’s already invested in both technologies.